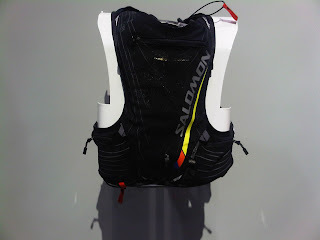 Road Trail Run: Outdoor Retailer-Salomon S-Lab Advanced Skin Hydration Pack- An OR Favorite! Outdoor Retailer-Salomon S-Lab Advanced Skin Hydration Pack- An OR Favorite! 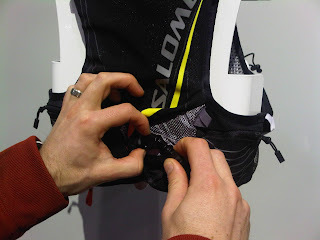 One of the products I was really looking forward to seeing was the Salomon S-Lab Advanced Skin Hydration Pack. It did not disappoint. This is one of the best engineered pieces of running, skiing, biking gear I have ever seen. I look forward to trying one on the run soon. 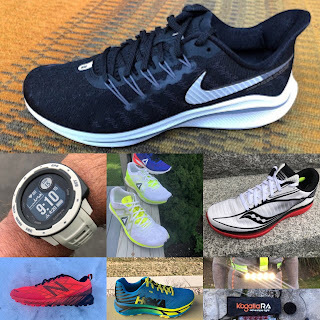 It was designed with help from Kilian Jornet twice winner of the Tour du Mont Blanc North Face® UTMB® & Skyrunning 2010 World Champion, 3rd at Western States 100 miles in 2010. Kilian is also the world ski mountaineering champion and he is only 22! Most hydration packs are just that, packs. The Advanced Skin is far more like its name than a pack. Very close to the body, wrapping around the upper torso with functional elements front and back. Soft padding throughout, very form fitting. I would expect no bounce or sliding side to side. 2 open pockets below. 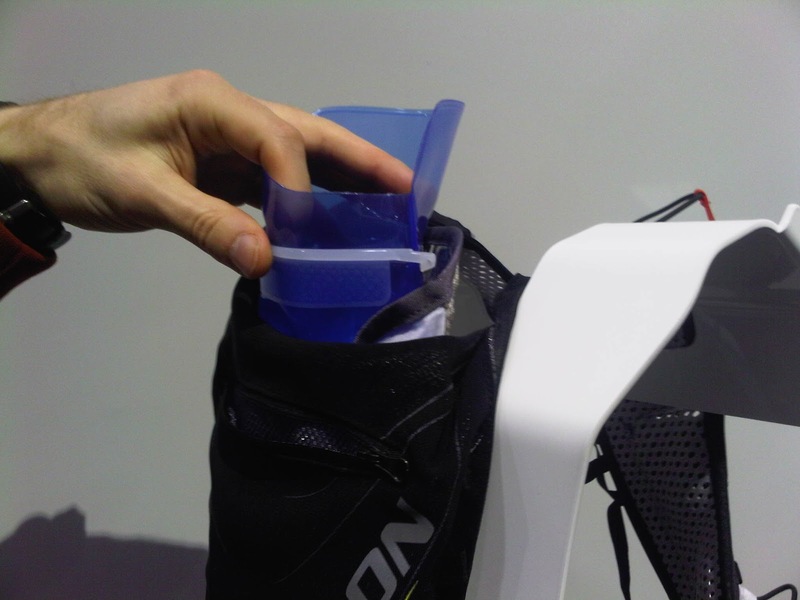 They will fit water bottles or can be used for nutrition. Salomon suggested one for gels, blocks, bars, the other for trash. 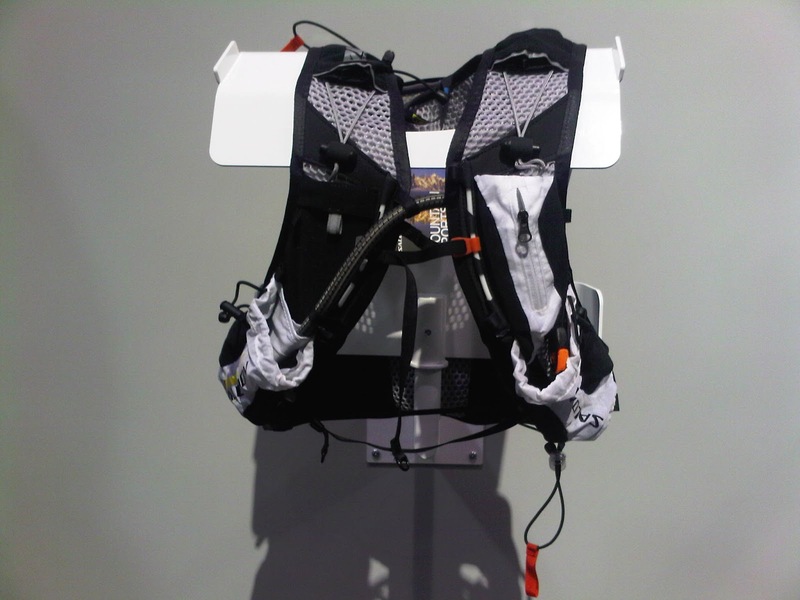 Visible on the right shoulder strap is a safety whistle, a required item for European trail ultras. Slightly elastic straps for easy breathing on the go. The loop on the bottom right with orange pull has a mate at top left. Put trekking poles through the top over the back to the right bottom and cinch. Euro trail runners often use light trekking poles for uphills. Insulated hydration tube runs from behind on the left, under the arm across to the front. Under a jacket in winter I bet it won't freeze as quickly as an over the shoulder tube, the way most backs route. Hydration bladder and decent sized main pocket, say for a light jacket. 2 side zippered pockets. The pack comes with a safety blanket, again a requirement for European ultras. 1.5 liters (51 oz) bladder. Anti microbial, inside an insulated sleeve. Note that 2 bike bottles can be added to the front pockets for approximately 90 oz of liquid. Bike bottles may interfere a bit with arm motion. 2. Pull bladder out the top. Opens fully for easy filling and cleaning. Reconnect the tube. 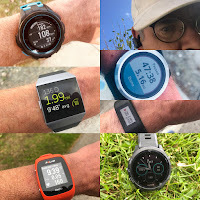 Uses: Trail and Road Running, Cycling, Nordic Skiing, Alpine Skiing, Hiking. As you say...They trully are a unique engeneering piece. I've used my pack skiing,running,biking and its great. Hi If you don't mind me asking, what sort of display is that Backpack on?